We work with our clients to fundamentally transform their sales organizations, focusing specifically on increasing sales revenue, sales margin and market share. What makes us different is how we get there. Our people understand what it's like to work in sales because we’ve led sales organizations and have decades of selling experience. Our methodologies are customized to your organization, ensuring they're relevant and immediately usable. Each of our programs have an extremely high adoption rate and longevity within the organization. Our recommendations and engagement process result in dramatic sales performance improvements for our clients. Our Experience Is Our Strength. Find out how Force Management can help you improve your sales initiatives and reach your goals. Our programs are grounded in your most pressing business objectives. They’re not based on outdated, cookie-cutter sales training methodologies. We don't ask you to discard the sales enablement investments you've already made. Instead, we tailor our materials to reinforce your existing processes, systems and sales training initiatives. In many cases, our approach actually improves the adoption of your current programs. Every engagement begins with a kickoff and discovery phase. Just like in a sales process, our project team gathers the insights needed about your company, organizational structure, buyers, products and industry. We'll assess where you have cross-functional alignment and where it can be improved. We'll figure out what dynamics are impacting your results and develop a road map to success. You play an integral role in ensuring that we gather the needed information from your internal players and your customers to ensure that our program is customized to your organization. Our series of high-impact workshops pull together the knowledge of senior members of your relevant teams to create the tools that will be rolled out to the entire organization. Our workshops are pivotal because they set the stage for alignment moving forward. This is one of the hardest stages, but our clients tell us repeatedly it's one of the most valuable. Watch the video to hear some of our repeat clients speak about the workshop process. The next step is to integrate the developed content into our baseline curriculum. We also identify and develop any new materials that are needed to support the sales training. 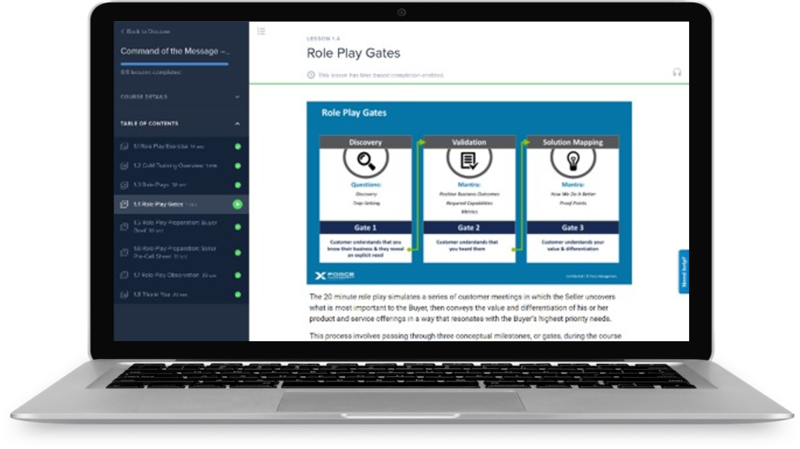 We want to ensure that everything rolled-out to your sales teams has cross-functional agreement and is relevant to what they do every day. This is also the stage where you sign off on anything that will be delivered to your teams. Delivery is the stage where we launch the program to your sales organization. This where that traditional B2B sales training happens. Our approach is based on state-of-the-art adult learning models. The majority of the instruction consists of role plays and practical exercises that take advantage of real-world selling scenarios. Pre-work is delivered via our Command Center engagement management system. We differentiate ourselves by ensuring that the desired learning behaviors are adopted in the short-term and sustained in the long-term. This step is where we help you execute the plan for adoption that was created in the earlier stages. It’s during the sustain phase where customer most often see the Force Management difference. You’ll see the power of our process and how it sets you up for adoption success. Our fast-start sessions, manager coaching and opportunity review add-on services are also incorporated in this phase should the client need them. The Command Center, our engagement management system, provides online courses and reinforcement modules that drive consistent reinforcement of the methodology. The Command Center is a mobile application built and used to support the development, accelerated adoption, and reinforcement of Force Management’s methodologies. Ready to chat about your revenue goals? Fill out the form on the right and we'll be in touch.